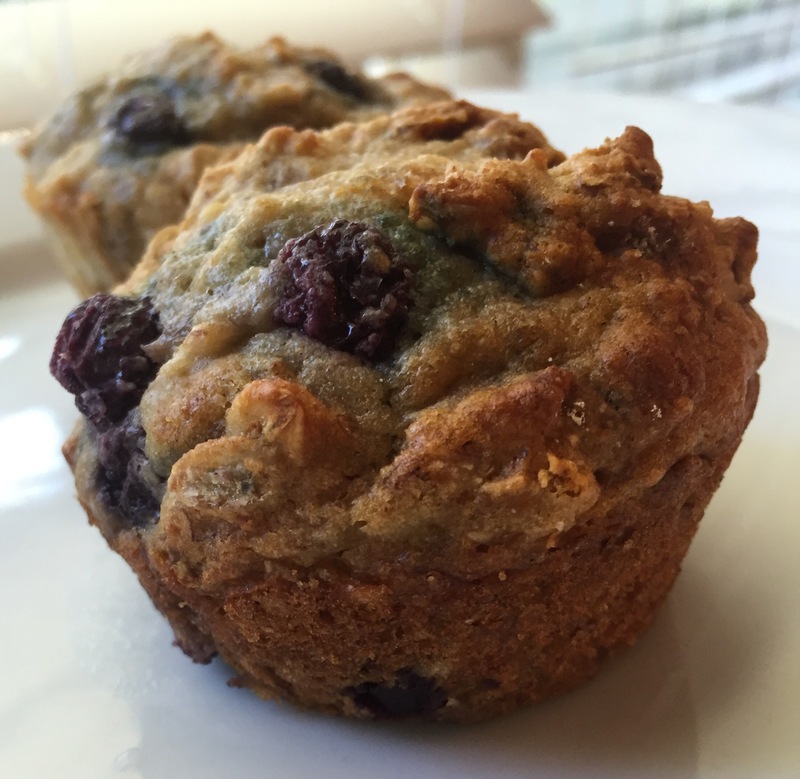 Banana Blueberry Whole Wheat Muffins – Make a double batch – you’ll be glad you did. Don’t opt out on the organic coconut palm sugar topping. It just makes that outside bite a tad sweeter, and who doesn’t like that??? One Skillet Chicken Fajitas – If you’ve spent any time on this blog, you’ve seen this recipe before. It’s fast, easy, and delicious. The filling options are limitless – allow your stomach be your guide. 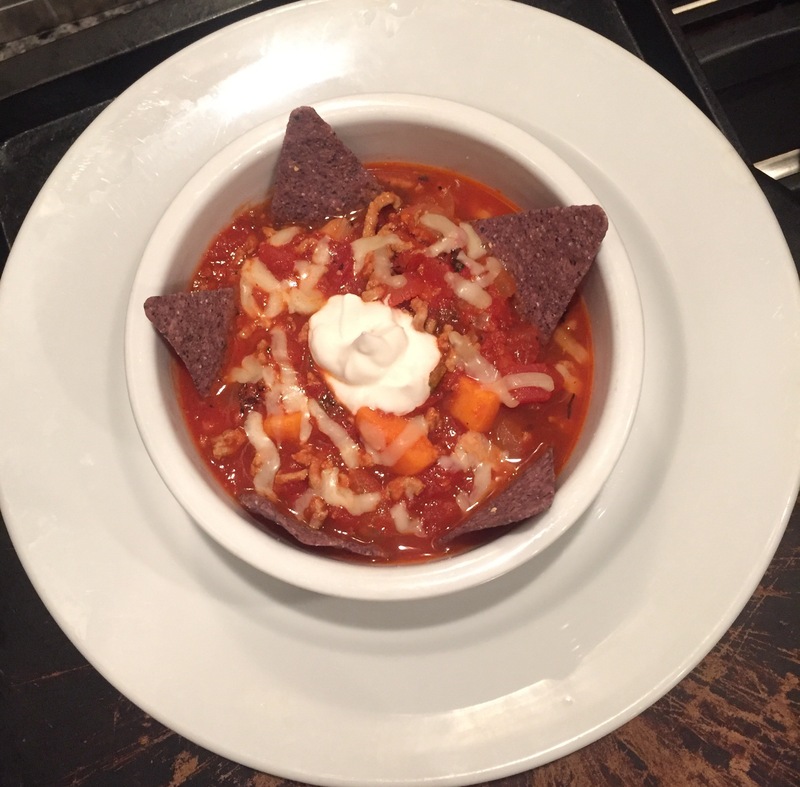 No Bean Turkey and Sweet Potato Chili – What makes this different from everyday chili is cumin. Cumin gives it an earthy, slightly spicy flavor that is distinctly yummy. The sweet potatoes are an added bonus that blend in with the southwestern feel. Finish it with a few organic chips and a dollop of organic Greek yogurt. 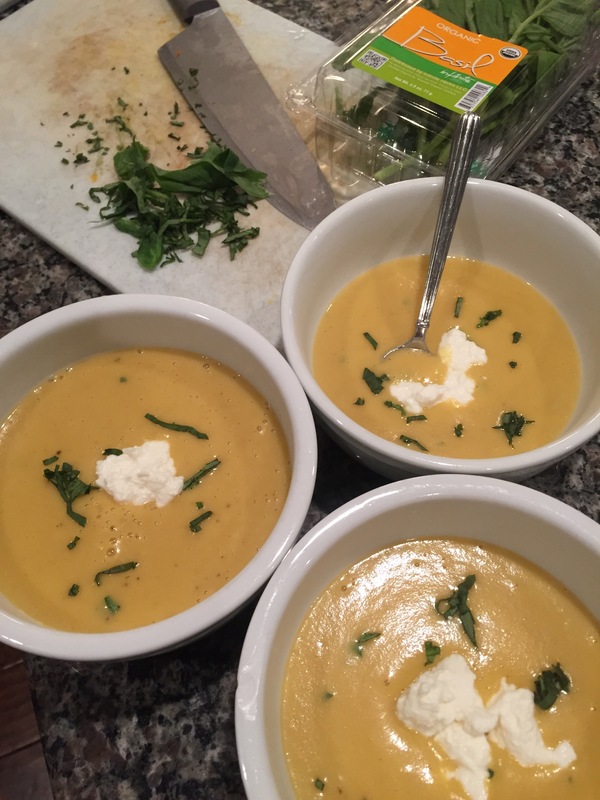 Creamy Squash Soup – This is my second go round with this recipe. I changed absolutely nothing from the last time. It’s a great creamy, fall soup. The buttermilk is an interesting twist. No worries, you don’t need to buy buttermilk. Make your own with regular milk and lemon or vinegar. Buttermilk recipe included! 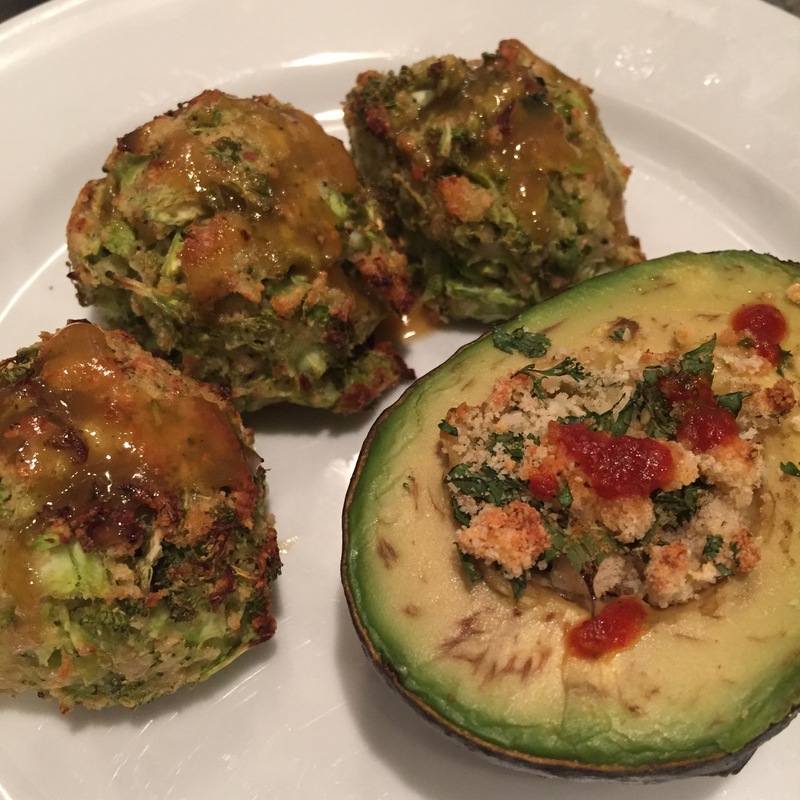 Eggs, Avocados, & Olive Oil Drop Biscuits with Easy Oven Bacon – Another solid recipe on repeat. This “breakfast for dinner” is a frequent request at my house. 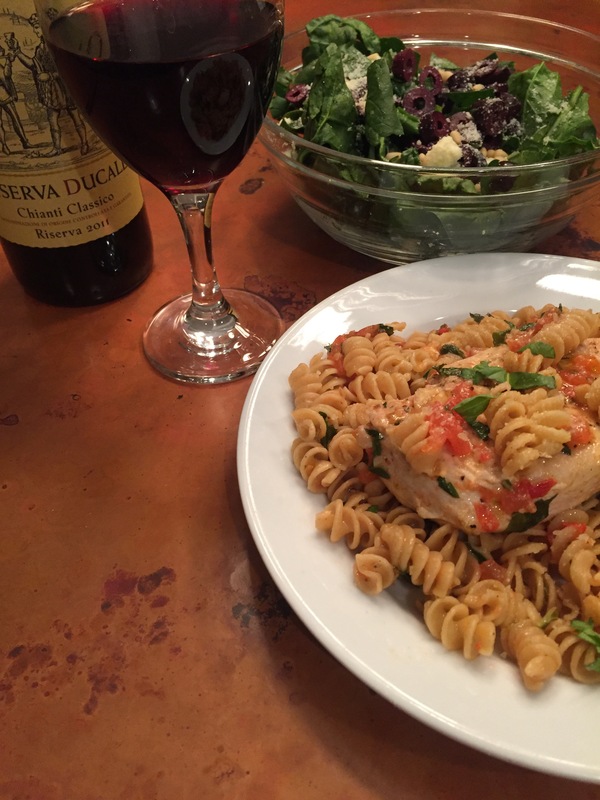 Tomato Basil Chicken Pasta – Bottom line…super duper easy crowd pleaser. Do things right and use a good quality cheese and olive oil to finish each plate. Directions: Preheat oven to 350 degrees. Spray muffin tins with olive oil (alternative: silicon muffin cups that require no greasing). In a large bowl, mash the bananas. Add the wet ingredients to the bananas and whisk to combine. Stir the dry ingredients in a small bowl. Add the dry ingredients to the wet and stir just until combined (ideally under stir it just a bit). Stir in the frozen blueberries – maximum of three turns of the spatula. 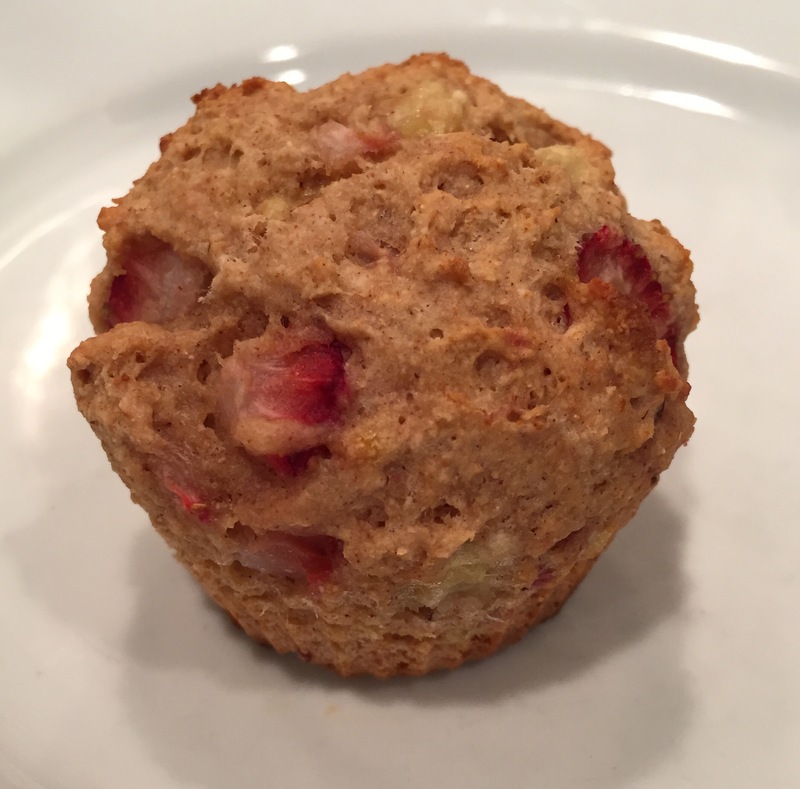 The less you mix, the better when it comes to muffins. 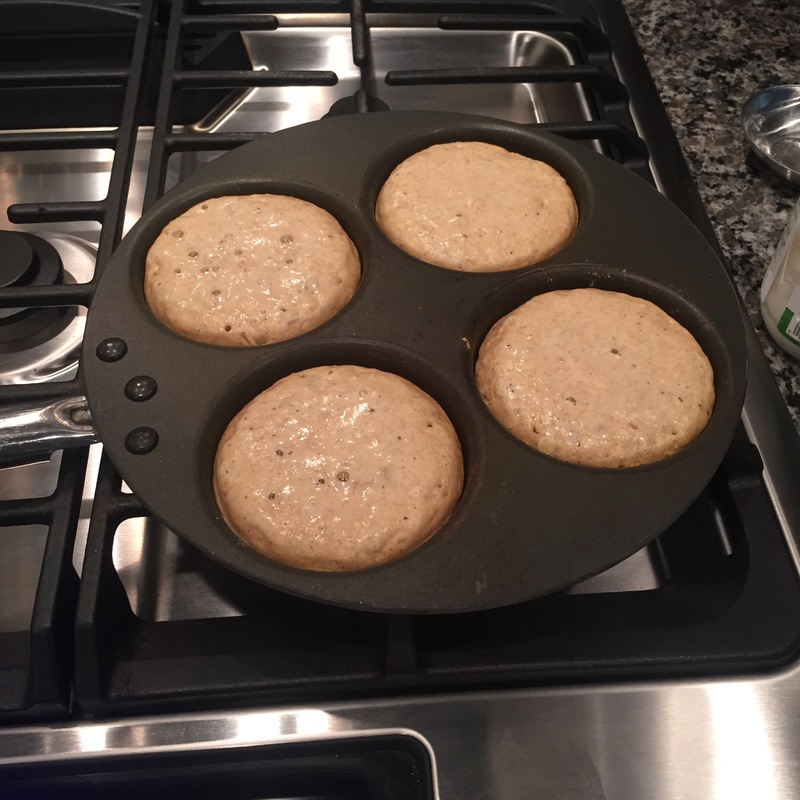 Fill muffin cups 3/4 full. Sprinkle each muffin with some palm sugar. Bake for 20/25 minutes. Directions: Warm a non-stick skillet to medium heat. Season all sides of the chicken with salt, pepper, and paprika. To the skillet, add the olive oil and chicken. Cook until the chicken is browned on all slides (about 5-6 minutes). Add onions and green peers, cooking until the peppers are softened. Add the garlic and cook until fragrant (about a minute). Immediately add all remaining ingredients. The tomatoes will sizzle in the skillet. Reduce heat to a simmer. Allow some liquid to cook out (about 10 minutes). Season with salt/pepper to taste. 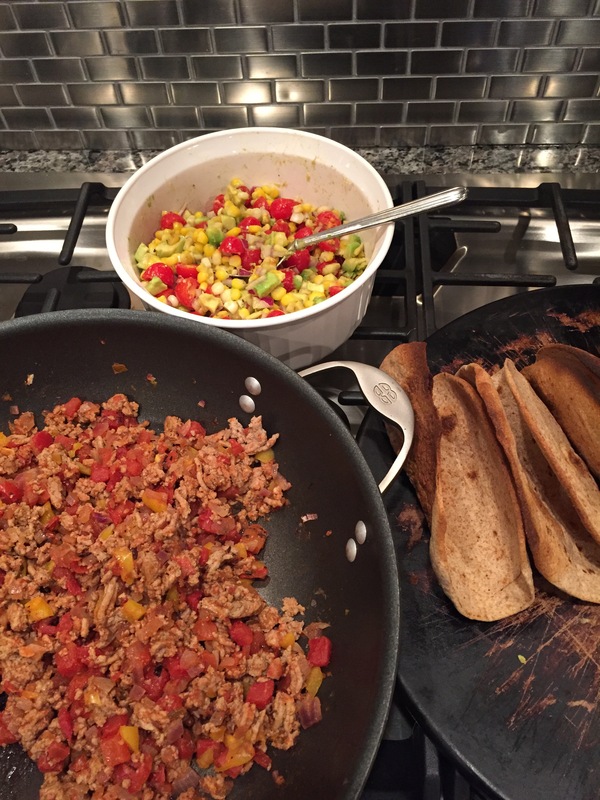 Serve with whole wheat tortillas and your favorite fajita fillers. Directions: In stock pot, on medium-high heat, coat the bottom of pan with olive oil. Add the turkey, cumin, chili powder, paprika, & sea salt. While stirring, break apart the turkey into small bits. Cook about 4-5 min. or until the turkey is no longer pink. Stir in the onion and cook until softened (about 4-5 minutes). Add the garlic and cook until the it’s fragrant (about a minute). Add remaining ingredients (tomatoes, tomato sauce, water, sweet potatoes, and bay leaf). Reduce heat to a simmer. Cover and simmer for 25 minutes. If it too thick, add some water. Remove bay leaf. Eat as is, or serve topped with chopped cilantro, a dollop of Greek yogurt, and a few crunched up sweet potato chips. Directions: Heat a large stock pot to medium heat. Add the butter and olive oil followed by the onions, squash, and salt/pepper. Give it a good stir and allow the veggies to cook until softened (about five minutes). In the meantime, microwave the cut potatoes for 3-4 minutes to soften them just a bit. Stir in the garlic to the stock pot and cook until the garlic is fragrant (about a minute). Add the potatoes to the stock pot, followed by the broth/stock. Bring it to a boil and then remove from the heat. Carefully pour the mixture into a blender to liquefy. If you have a superb quality blender, this will be your final step (other than to stir in the buttermilk right before serving). If your blender is so-so, you may need to pour the soup over a strainer to create a smooth, creamy texture. If the latter is your method, stir in the buttermilk, after straining. Season with salt/pepper to taste. Drop in a dollop of Greek yogurt and sprinkle with fresh herbs. Tip: Microwave hearty winter squash for 1-2 minutes prior to peeling. Use a shark knife to easily remove the outer skin. This meal requires a bit of commentary to help ensure the steps are timed right. The bacon is prepared for baking (line baking sheet with foil & lay out the individual bacon slices). Similarly, the biscuits are prepared and ready to pop in the oven, when it’s time. Once these both are in the oven (which does not happen simultaneously – keep reading below), the avocados and eggs are prepared. This meal starts with a cold oven. The bacon goes in the cold oven, and then it’s turned on and begins to heat. When the oven reaches full temperature, the biscuits go in the oven. When the biscuits are done, your bacon will most likely be done too. (An exception would be for those who desire exceptionally crispy bacon. In that case, the bacon may need to remain in the oven a few minutes longer than the biscuits). Directions: Line a baking sheet with foil. Arrange the bacon on the baking sheet in a single layer. Place the bacon in a cold oven (note: the oven is NOT preheated). Heat the 450 degrees. Bake for 15 to 25 minutes, depending on your preferred doneness. It’s soooo easy this way, and there is no mess! Directions: In a small bowl, combine the flour, salt, and baking powder. In another small bowl, whisk together the milk and olive oil (add the sweetener now, if using it). Add the dry ingredients to the wet and stir just until combined. Use large serving spoons or a large scooper to “drop” the biscuits on a baking sheet. Once the oven reaches 450 degrees, bake for for approximately 10-12 minutes, or until slightly golden. While the biscuits are baking, prepare the avocados and eggs. Directions: Half the avocados, remove the seeds, and scoop the goodness into a small bowl. With a fork, mash the avocado. Season with salt/pepper and add a squeeze of lemon (note: lemon keeps the avocado from browning). Stir once more. Cook the eggs as desired. I typically scramble the eggs for a week night meal. However, sunny side up (AKA “dippy eggs” in my house) is also popular. The warm, but still liquid yolk, adds richness to each bite! Start with an upside down biscuit (the flat surface is key). Next, is a healthy slathering of the avocado mixture. Finally, top with eggs, pressing the eggs into the avocado to help them “stick” to the biscuit. Finish with a dash or two of Tobasco style hot sauce, if you’re feeling daring. It really adds a great layer of flavor. Directions: Sprinkle both sides of the chicken with sea salt/pepper and 21 Seasoning Salute. Warm a large skillet and the olive oil to near medium heat. (Yes, you need all 4 tablespoons of olive oil). This is an olive oil and fresh tomato sauce. While the skillet heats, bring a stock pot filled with water to boiling. Cook the pasta until al dente. Drain, but do not rinse once cooked. Add the chicken to the hot skillet. Flip the chicken once it has cooked halfway up the sides (approximately 4 minutes). After cooking an additional 4 minutes on the other side, add the tomatoes and garlic to the skillet. Give it a stir. Add the basil and the butter. (The butter is critical). It adds a certain silkiness that makes it oh so yummy. Stir everything one more time. Season with salt/pepper to taste. Serve each plate with some fresh basil, cheese, and a drizzle of olive oil. A special thanks Mary Margaret for sharing gardening ideas and delicious recipes while we traveled to Italy. While in Italy, we embraced the 10% of 90%/10% philosophy of real food eating. This was especially true when it came to gelato. I’m talking twice a day, most days. How could we pass on opportunities to experience flavors like basil, nutello, and limoncello gelato? When in Rome, right? When our “holiday” ended [insert heavy sigh and sad, teary face], we returned to real life and real food eating resumed. To help our systems quickly adjust to better eating habits, our sweets primarily consisted of fruit. A non baked snack for us was Roasted Beet Chips. [I can already hear the groaning and moaning.] I’m generally not a beet person either; however, when they are roasted something fantastic occurs. They become sweet, crunchy, a bit salty, and down right addictive. They taste nothing like pickled beets that I despise. My only complaint … they are a wee bit messy to work with as nearly anything they come in contact with turns pinkish. The first thing my little one asked for when we returned from Italy was biscuits. 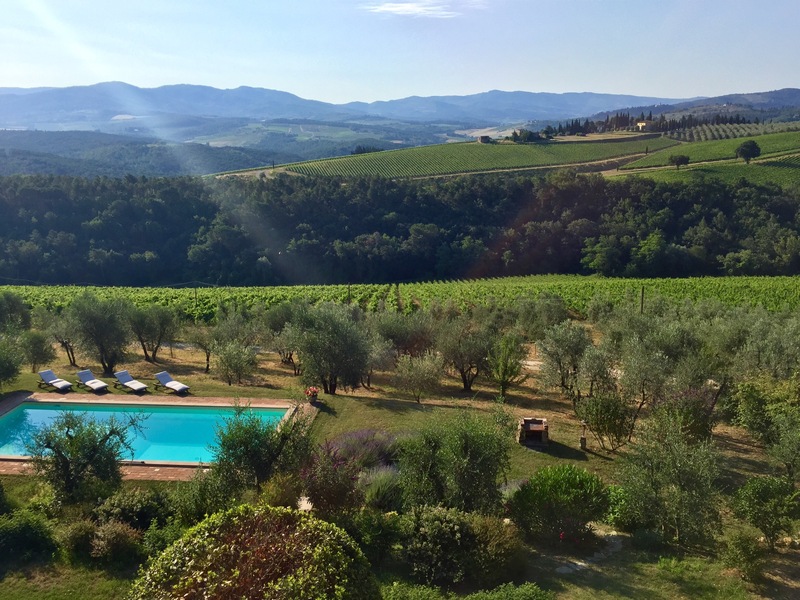 (Baking on my part in Tuscany was nonexistent). We love Olive Oil Drop Biscuits. 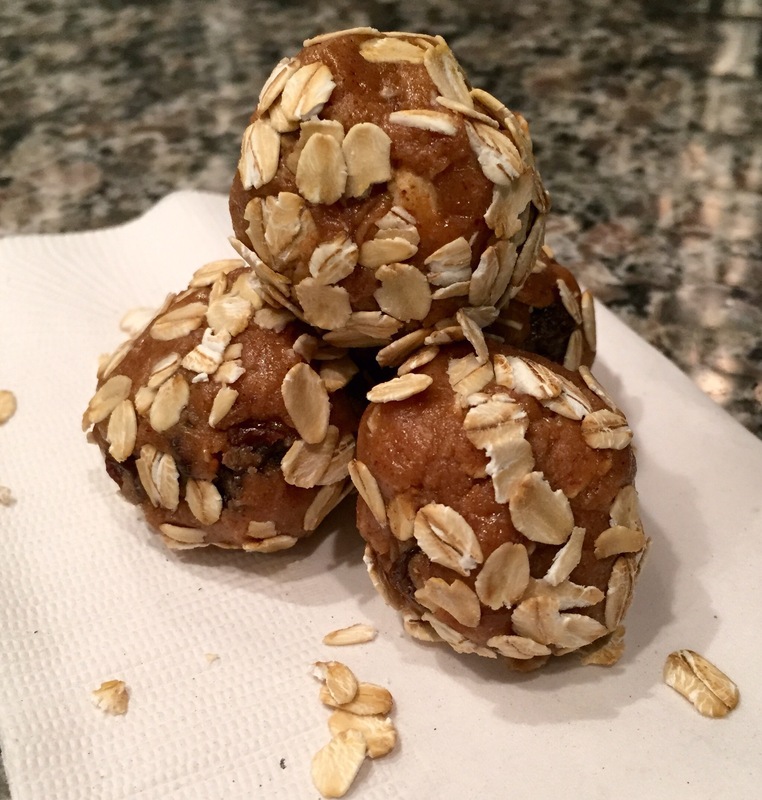 They have 5 ingredients and are ready in no time. Top them with a bit of local honey … buon appetito. Breakfast is served. Summer salads are another way to get a handle on all of the summer veggies. 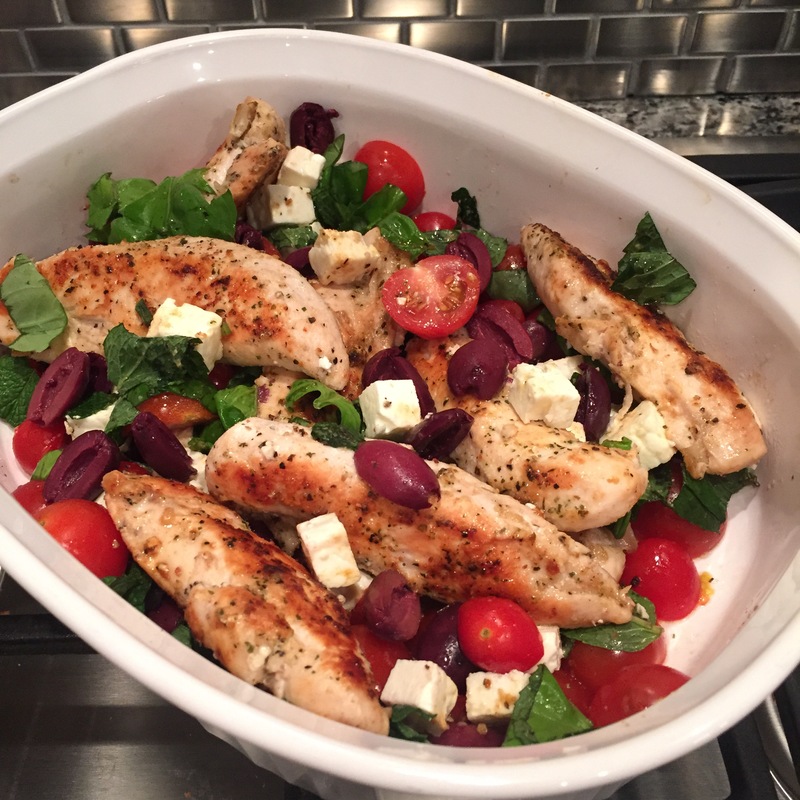 The Greek Chicken With Kalamata Olives & Feta is ready in no time, and it is made better with fresh basil, mint, and summer tomatoes. Take the flavor to another level by marinating the chicken the night before. No time for that? No worries. It’s delicious either way! Two other dishes that made the meal plan cut were Eggs & Avocados Toast With Bacon and Hard Shell Tacos with Avocado Tomato & Corn Salad. Who doesn’t love “Taco Tuesday?” It’s even better when the taco seasoning isn’t full of preservatives and ingredients you can’t pronounce and the taco shells don’t come from GMO corn? Easily transform soft tortillas into hard shell tacos, and make a batch of your own taco seasoning for now and later. No time for a slow food dinner one night during the week resulted in Eggs & Avocados Toast for us. 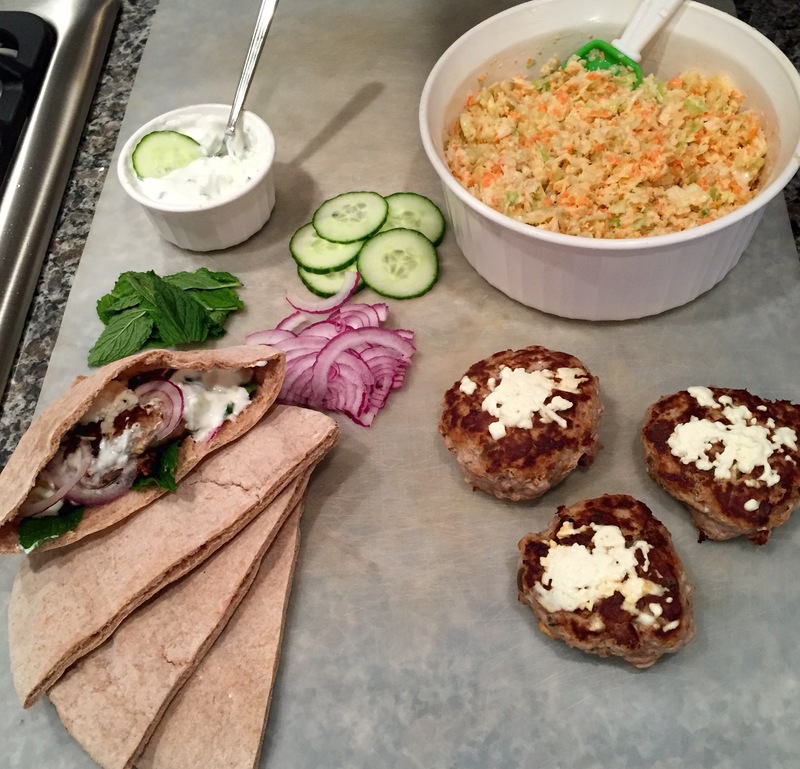 These items are staples in our pantry and make for dinner in a flash! Smartphone viewers, sign up to receive email notification of new blog posts at the bottom of the page. Directions: Preheat the oven to 450 degrees. In a small bowl, combine the flour, salt, and baking powder. In another small bowl, whisk together the milk and olive oil (add the honey now, if using it). Add the dry ingredients to the wet and stir just until combined. 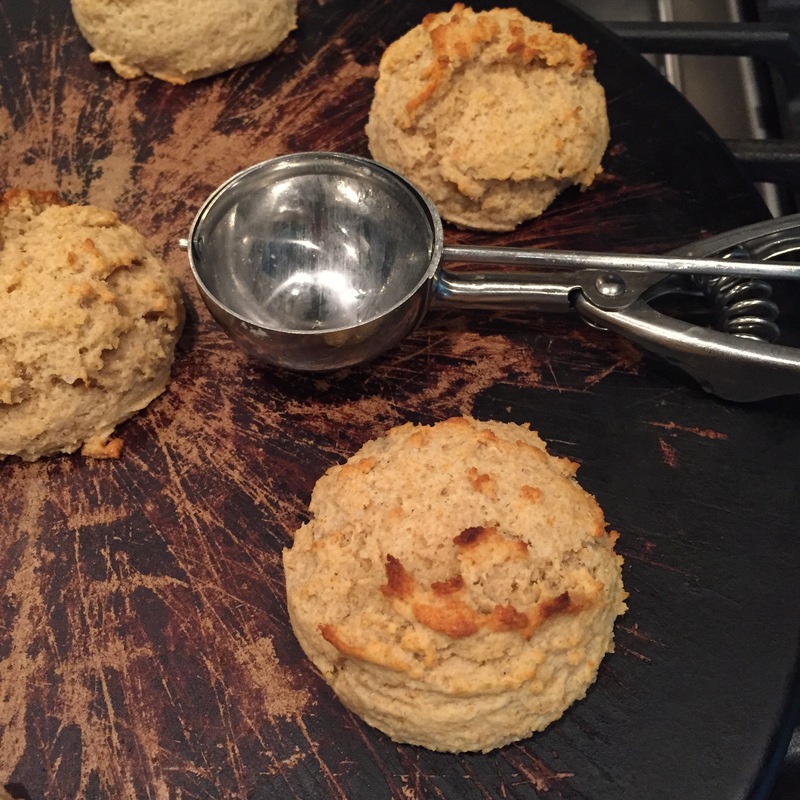 Use large serving spoons or a large scooper to “drop” the biscuits on a baking sheet. Bake for approximately 10 minutes and slightly golden. Tips/Notes: Prepare your mind as things are about to get pink! You may want to use gloves and/or protect your counter top. Use a cutting board and/or work surface that you don’t mind having a semi-permanent pinkish color. Directions: Preheat oven to 350 degrees. Line a baking sheet with parchment paper or foil. Cut the beets near the stems, leaving .5” remaining (so you have something to hold while slicing). Wash the beets in warm water and pat dry. Slice the beets using a mandolin (or by hand). Dry them with paper towels or a towel you don’t mind getting “pinked.” Toss them with a tablespoon or two of olive oil and lightly sprinkle with sea salt. Lay them in a single layer on the baking sheet. Bake for 20 minutes and then flip and bake another 15-20 minutes until they are crisp. Enjoy warm or cooled. Ooops!! I forgot to take a picture of these guys. They were gobbled up! Directions: Preheat the oven to 425 degrees. Line a baking sheet with foil or parchment paper. Slice each tomato into three (.5 inch) rings. Remove the seeds around core areas to get rid of excess juices. Place the tomatoes on the baking sheet. Sprinkle with salt/pepper and the dried herbs. Top them with a drizzling of olive oil. Roast for 20-30 minutes. Finish with a sprinkling of fresh basil and Parmesan cheese. Up the ante with a final drizzle of olive oil. Directions: Warm a large skillet to medium heat adding olive oil to coat the pan. Add the garlic and cook until fragrant (about a minute) before adding the corn, zucchini, salt/pepper, oregano, and ½ of the fresh herbs. Continue to cook until the zucchini is soft (about 5 minutes). Technically, at this point you can finish the dish by squeezing the lemon juice atop and stirring in the remaining fresh herbs and cheese. Or, you could reduce the heat to low and add the finishing ingredients (fresh herbs, lemon, and cheese) immediately before you are ready to serve. This can remain on low for quite some time. As long as you don’t mind that the zucchini will continue to soften as it cooks, the flavor is not at all compromised. Directions: Preheat oven to 425 (bake, NOT convection). In large bowl, toss the florets, olive oil, salt/pepper, & garlic. Arrange in a single layer on parchment or foil lined baking sheet. Roast for 20-25 minutes (flipping them at about 10 minutes in). 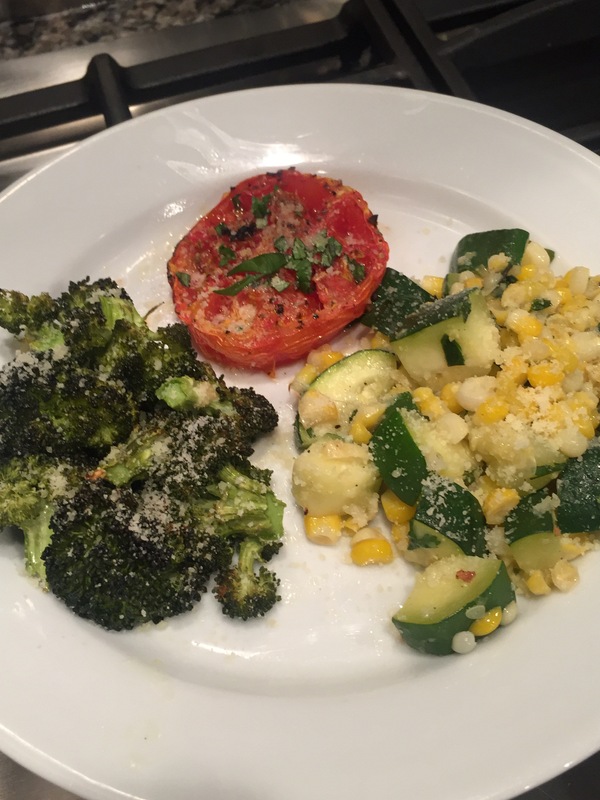 Finish this dish with a squeeze the lemon atop and a sprinkle with Parmesan cheese. Serve immediately! Directions: Remove marinated chicken from the liquid. Do not rinse. Season the chicken with sea salt/pepper. Pan sear the chicken in 1 tablespoon of olive oil until cooked. Remove from the skillet and allow to rest (do not cut the chicken). In a large bowl, add the remaining ingredients (tomatoes, olives, feta, mint and basil leaves, olive oil, salt/pepper) and stir. Slice the chicken into bite size pieces and add it to the salad. Season with salt/pepper to taste. Directions: Add all ingredients to a lidded container and refrigerate overnight. Directions: Heat medium skillet to medium. Add olive oil and corn. Saute 4-5 minutes until done. Remove from heat. In a medium bowl, add all ingredients except the avocado and stir. Add the avocado and gently stir to combine. Give one last squeeze from the lime to help coat the avocado to keep from browning. Refrigerate until ready to eat. Directions: Preheat the oven to 450 degrees. Hang tortilla shells over two oven rack bars (like a pair of pants hanging on a clothes hanger). If you hand them over 1 rack, they will harden nearly closed and you won’t be able to “stuff” it with taco fillings. Bake for 5-7 minutes until slightly browned and stiff. Remove from oven and set aside until ready for use. Directions: Heat the same skillet you used to sauté the corn to medium heat. Add olive oil to coat bottom of the skillet. Next, add the turkey and taco seasoning. Cook until no longer pink (about 5-7 minutes). Add the onion and bell pepper. Cook another 5 minutes or until softened. Stir in the tomatoes and allow to simmer until excess liquids have reduced. Remove from heat. Make tacos! Directions: In a small bowl, use your hands to mix together the olive tapenade, ground turkey, ¼ c. feta cheese, and salt/pepper. Form into four patties. Pan sear on medium heat (approximately 6 minutes per side). After flipping, top with the remaining feta cheese. Allow to rest a few minutes after cooking to seal in the juices. Serve with any or all of the above sandwich toppings. Directions: In a small bowl, add all ingredients and stir. Refrigerate until ready to use. Directions: If cooking the bacon in a skillet, begin this process first since it takes the longest. While the bacon is cooking, halve the avocados, remove the seed, and scoop the goodness into a small bowl. With a fork, mash the avocado. Season with salt/pepper and add a squeeze of lemon (note: lemon keeps the avocado from browning). Stir once more. In a medium skillet, scramble the eggs. While the eggs are cooking, toast the bread and slice the tomatoes. Assemble the open faced sandwiches (toast, bacon slices, even layer of avocado, eggs). I finish mine with a layer of tomatoes. The rest of the family passes on the tomatoes. 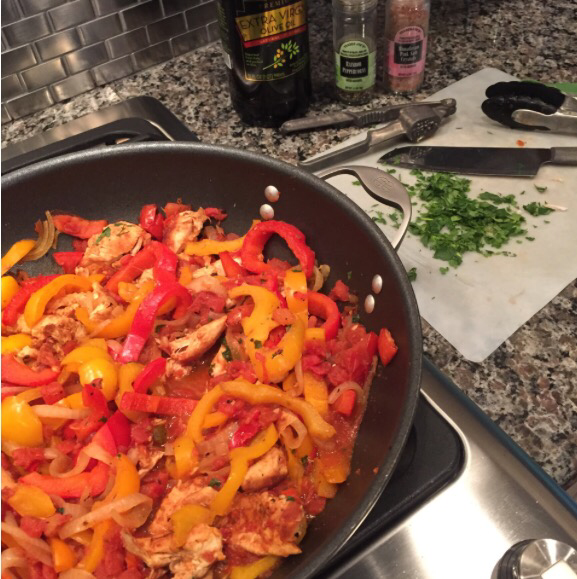 Finish with a dash or two of Tobasco style hot sauce, if you’re feeling daring.